Join Us!!! We are looking for someone to help us cover Cameroonian basketball. Please send us an e-mail. Angolan Point Guard Yanick Moreira (211-C-91, college: SMU) did not play a significant number of minutes in the second half of his nation's 77-73 win over Cameroon in the FIBA 2019 World Cup qualifiers. The Guard was ejected in the early minutes of the third quarter after wiping his face with Cameroon Head Coach Lazare Adingono's towel. Yanick Moreira was on a good run prior to the ejection registering 13 points and nine rebounds but missed the tough battle later on in the game. Veteran Guard Carlos Morais (200-G-85, agency: Duran International) came through for Angola in the final minutes of the game as Cameroon threatened to clinch the game's win. His three pointer with 46 seconds remaining handed Angola the game's lead and win; Morais did not play for Angola is the last round of qualifiers. The win keeps Angola in second place and on track to book a spot in China next year for the World Cup. Group E leaders Tunisia beat Morocco 89-51. Tunisia and Group F leaders Nigeria have qualified to the 2019 World Cup. Here is the weekly review of the top performing Cameroonian players, who play currently abroad. #1. This week's number one is an international forward Kenny Kadji (211-88, college: Miami, FL, currently plays in Turkey). 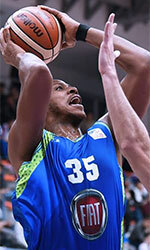 Kadji could not help Tofas (14-13) in their last game. Despite his very good performance Tofas was edged 76-75 on the road by the lower-ranked (#6) Galatasaray. Kadji recorded 15 points and grabbed 6 rebounds in 28 minutes on the court. His team will play only one more game in the Regular Season. And that game will be critical. Kadji has relatively good stats this year: 11.8ppg, 4.5rpg, 1.3apg, 2FGP: 48.0%, 3FGP: 35.4% and FT: 75.0% in 23 games he played so far. He is currently a member of the Cameroonian senior national team. #2. Second place goes to an international center Landry Nnoko (208-94, college: Clemson, currently plays in EuroCup). Nnoko was not able to help ALBA Berlin in their game against Valencia Basket (6-0) in the Eurocup. He scored 9 points and grabbed 4 rebounds in 15 minutes. But the first-placed ALBA Berlin (5-1) was crushed 89-63 in Valencia by the leading Basket in the group E of Eurocup. This year Nnoko averages: 5.9ppg, 5.1rpg, 2FGP: 51.4% and FT: 61.9% in 15 games. He is in the roster of the Cameroonian senior national team. #3. The Cameroonian player who performed third best last week abroad was an international forward Frank Tchoubaye (198-92, currently plays in France). Tchoubaye led Souffelweyersheim to a victory against the eighth-ranked Rueil (5-8) 91-79 in the French NM1 (third division) on Saturday night. He scored 18 points and grabbed 8 rebounds. BC Souffelweyersheim (10-2) is placed first in Places 1-10 group. This season Tchoubaye has relatively solid stats: 10.1ppg, 3.6rpg, 1.5apg, 1.6spg, 2FGP: 43.6%, 3FGP: 36.5% and FT: 69.0%. Ex-Condor de Yaounde player is also a member of the Cameroonian senior national team. #4. Center Alexis Wangmene (205-89, college: Texas, currently plays in Belgium) was the major contributor in a Liege Basket's victory against the closely-ranked Limburg United (11-15) crushing them 100-80 in the Belgian Euromillions League in Sunday night's game. He scored 23 points and grabbed 7 rebounds in 23 minutes. betFIRST Liege Basket (14-8) is placed fifth in the Euromillions League. Wangmene has individually a very good year with high stats. He averages: 16.6ppg and 8.0rpg in 12 games. Wangmene used to play for the Cameroonian national team back in 2015. #5. An experienced international shooting guard D.J. Strawberry (196-85, college: Maryland, currently plays in Spain) managed to help Herbalife Gran Canaria to win against the 15th-ranked Baloncesto Fuenlabrada (9-17) 93-88 in the Spanish Liga Endesa last Sunday. He scored 5 points and added 4 assists. Herbalife Gran Canaria (13-13) is placed ninth in the Liga Endesa. They ended the series of three consecutive loses. Strawberry has reliable stats this season: 10.2ppg, 2.2rpg and 1.9apg. He has a dual citizenship: Cameroonian and American. Strawberry plays currently for the Cameroonian national team. #6. Center Gaston Essengue (203-83, college: UNLV, currently plays in Argentina) led CA Platense to a victory over the eighth-ranked Parque Sur (12-14) 75-68 in the Argentinian La Liga Argentina (second division) on Wednesday night. He was MVP of the game. Essengue scored 18 points, grabbed 7 rebounds and dished 3 assists in 37 minutes. Club Atletico Platense Florida (22-4) is placed tenth in South group. It was his team's third consecutive victory in a row. The Regular Season already ended. Essengue's stats this year are: 14.5ppg, 5.7rpg and 1.2apg in 10 games. He is a former international player as he played for the Cameroonian senior team four years ago. #7. International forward Benoit Mbala (203-95, currently plays in France) was not able to secure a victory for Aix-Maurienne (8-18) in their last game on Friday. Despite Mbala's very good performance Aix-Maurienne was defeated 87-78 at home by the higher-ranked Nantes (#10). He recorded a double-double by scoring 19 points and getting 11 rebounds. This season Mbala has very high stats. He averages: 15.6ppg, 7.4rpg and 1.2spg. Mbala is also Cameroonian national team player. #8. Forward Williams Narace (201-97, currently plays in France) couldn't help Sluc Nancy (18-8) in their game against SPO Rouen (17-9) in the French ProB (second division). Narace was the second best scorer with 9 points in 24 minutes. But Sluc Nancy lost 68-82 in Rouen to the lower-ranked (#6) SPO Rouen. This year Narace's overall stats are: 7.2ppg and 4.5rpg in 26 games. He plays currently for the Cameroonian national team. #9. Former international point guard Aldo Curti (180-87, currently plays in France) is a teammate of previously mentioned Frank Tchoubaye and both played together in the last French NM1 game. Curti contributed to Souffelweyersheim's victory against the eighth-ranked Rueil (5-8) 91-79. He scored 5 points and added 9 assists. Curti's total stats this season are: 9.7ppg, 3.0rpg, 5.3apg and 1.4spg. He used to play for the Cameroonian national team four years ago. #10. Center Junior MBida (206-90, currently plays in France) couldn't help Entente Orleans 45 (18-8) in their game against C'Chartres (13-9) in the French ProB (second division). MBida scored 8 points in 17 minutes. Entente Orleans 45 was edged 84-82 on the opponent's court by the lower-ranked (#4) C'Chartres. This year MBida's total stats are: 7.1ppg, 5.3rpg and 1.1bpg in 26 games. He is a former international player as four years ago he still played for the Cameroonian senior national team. #11. International guard Gedeon Pitard (188-89, currently plays in France) couldn't help Chalons-Reims in their game against ASVEL Lyon-Villeurbanne Basket in the French Jeep ELITE ProA. Pitard scored 5 points. His team was defeated 82-73. Pitard has averaged so far 4.3ppg, 2.2rpg and 2.1apg. He plays currently for the Cameroonian national team. #12. Former international forward Harding NaNa (203-81, college: Delaware, currently plays in Switzerland) couldn't help Swiss Central in their game against Starwings in the Swiss SBL. He recorded 7 points and grabbed 7 rebounds in 27 minutes. His team lost 104-109. NaNa averaged so far 12.6ppg, 6.1rpg and 2.1apg in 14 games. He used to play for the Cameroonian national team back in 2015. #13. International forward Arnaud-William Adala Moto (198-93, agency: Duran International, college: Towson, currently plays in France) contributed to a JA Vichy's victory against the ninth-ranked ADA Blois 84-73 in the French ProB (second division) on Friday night. He scored 5 points. Adala Moto has averaged so far 6.5ppg and 2.7rpg. He is also Cameroonian national team player. #1. Joel Embiid (213-C-94, college: Kansas, currently plays in NBA) could not help the Philadelphia 76ers (51-31) in their last game. Despite his very good performance the Philadelphia 76ers (51-31) lost 102-111 on the road to the Brooklyn Nets. Embiid had a double-double by scoring 22 points and getting 15 rebounds. He also added 4 assists and 5 blocks in 24 minutes. It's Embiid's fifth season with the team. Embiid has individually a very good year with high stats. He averages: 27.4ppg, 13.6rpg, 3.7apg and 2.0bpg in 65 games he played so far. #2. Pascal Siakam (206-F-94, college: N.Mexico St., currently plays in NBA) was not able to help the Toronto Raptors (58-24) in their last game on Saturday. Despite Siakam's very good performance the Toronto Raptors (58-24) were edged 104-101 in Orlando by the Magic. He was the second best scorer with 24 points. Siakam also added 9 rebounds, 4 assists and made 2 blocks. This season Siakam has very high stats. He averages: 17.0ppg, 6.9rpg and 3.1apg. #3. JP Tokoto (198-F-93, college: UNC, currently plays in Israel) was the major contributor in a Hapoel Eilat's victory against one of league's weakest teams Ironi Nahariya (7-19) crushing them 90-69 in the Israeli Winner League in Monday night's game. Tokoto recorded a double-double by scoring 15 points and getting the same number of rebounds. He also added 4 assists. Hapoel Eilat (18-9) is placed fourth in the Winner League. It was his team's fourth consecutive victory in a row. This season Tokoto has relatively solid stats: 14.1ppg, 7.4rpg, 3.3apg and 1.7spg. He has a dual citizenship: Cameroonian and American. #4. Nicolas Batum (203-SF-88, currently plays in NBA) managed to help Charlotte Hornets in a victory against the Cleveland Cavaliers (19-63) crushing them 124-97 in the NBA last Tuesday. He scored only 3 points and grabbed 6 rebounds in 32 minutes. The Charlotte Hornets have 39-43 record this season. It was his team's fourth consecutive victory in a row. The Regular Season already ended in the NBA. It's Batum's fourth year with the team. Batum's stats this season are: 9.3ppg, 5.2rpg and 3.3apg in 75 games. He is another player who holds two passports: French and Cameroonian. #5. Paul Biligha (200-C/F-90, agency: Players Group, currently plays in Italy) contributed to an Umana Venezia's victory against the tenth-ranked MIA-RO Cantu (13-13) 94-90 in the Italian Serie A on Sunday night. Biligha scored only one point. Umana Reyer Venezia (18-8) is placed second in the Serie A. There are only four games left until the end of the Regular Season. So now every game will be critical. Biligha's overall stats this season are: 4.4ppg and 1.7rpg. He has both Cameroonian and Italian nationalities. #6. Ralph Temgoua (194-G-87, college: St.Lawrence, currently plays in France) was not able to secure a victory for SO Maritime Boulogne in their game against JSA Bordeaux in the French NM1 (third division). Temgoua cannot count Saturday's game as one of the best ones. He scored only 3 points in 22 minutes. His team was edged 83-82. Temgoua has averaged so far 8.9ppg, 2.8rpg and 2.3apg in 30 games. He also holds two passports: Cameroonian and French. #7. Experienced Tcheussi Aristide Mouaha (190-G-0, agency: Two Points, currently plays in Italy) couldn't help Roma S.Azzurra (15-13) in their last game on Saturday. Despite Mouaha's very good performance Roma S.Azzurra (#8) was edged 78-77 at home by the higher-ranked Viola RC (#4) in the Group D. He was the second best scorer with 20 points. Mouaha also added 5 rebounds. This season Mouaha has very high stats. He averages: 17.6ppg, 5.3rpg, 2.5apg and 2.1spg. #8. Paul Herman Eboua (203-F/C-0, currently plays in Italy) contributed to a Roseto Sharks' victory against the 11th-ranked Bondi Ferrara 82-77 in the Italian Serie A2 (second division) in Sunday night's game. Eboua scored 8 points and grabbed 6 rebounds in 18 minutes. Eboua has averaged so far 6.0ppg and 3.5rpg in 29 games. #9. Cedric Keller (204-F/C-1, currently plays in Italy) is a teammate of previously mentioned Tcheussi Aristide Mouaha and both played together in the last Italian Serie B game. Keller couldn't help Roma S.Azzurra (15-13) in their last game on Saturday. Despite his good performance Roma S.Azzurra (#8) was edged 78-77 on their home court in Roma by the higher-ranked Viola RC (#4) in the Group D. Keller scored 13 points and grabbed 6 rebounds. Keller has averaged so far 3.7ppg and 2.9rpg. #10. Philippe Bayehe (204-C/F-99, currently plays in Italy) is a teammate of previously mentioned Paul Herman Eboua and both played together in the last Italian Serie A2 game. Bayehe helped Roseto Sharks win their game against the 11th-ranked Bondi Ferrara 82-77. He scored 6 points. Bayehe has averaged so far 1.7ppg and 1.1rpg. We bring you last week's top performances from Cameroonians who are playing abroad and who all have had prior experience of national team duties at youth or senior level. #1. This week's number one is an international center Landry Nnoko (208-94, college: Clemson, currently plays in Germany). Nnoko managed to help ALBA Berlin to win against the eighth-ranked ratiopharm Ulm (14-12) 92-81 in the German BBL in Tuesday night's game. He scored 5 points and grabbed 10 rebounds. ALBA Berlin (19-5) is placed fourth in the BBL. It was his team's fourth consecutive victory in a row. This season Nnoko averages: 8.5ppg, 6.3rpg, 2FGP: 70.6%(48-68) and FT: 79.3%. He is currently a member of the Cameroonian senior national team. #2. Second place goes to former international center Alexis Wangmene (205-89, college: Texas, currently plays in Belgium). Wangmene could not help Liege Basket (14-8) in their last game. Despite his very good performance Liege Basket was edged 75-72 on the road by the lower-ranked (#5) Belfius Mons-Hainaut. Wangmene was the top scorer with 26 points. He also added 9 rebounds in 32 minutes. Wangmene has individually a very good year with high stats. He averages: 17.2ppg, 8.2rpg, 2FGP: 56.6%(56-99) and FT: 72.9% in nine games he played so far. Wangmene played for the Cameroonian national team in 2015. #3. The Cameroonian player who performed third best last week abroad was an international shooting guard Jeremy Nzeulie (188-91, currently plays in France). He contributed to a SIG Strasbourg's victory against the closely-ranked JDA Dijon (20-5) 91-78 in the French Jeep ELITE ProA on Saturday night. Nzeulie recorded 6 points. SIG Strasbourg (15-10) is placed sixth in the Jeep ELITE ProA. Nzeulie's overall stats this season are: 7.6ppg, 2.5rpg, 1.6apg, 2FGP: 41.4%, 3FGP: 30.4% and FT: 73.1%. He has a dual citizenship: Cameroonian and French. Nzeulie is also a member of the Cameroonian senior national team. #4. An experienced shooting guard D.J. Strawberry (196-85, college: Maryland, currently plays in Euroleague) was not able to help Gran Canaria in their game against Bayern Muenchen (14-16) in the Euroleague. He scored 8 points in 18 minutes. Gran Canaria lost 77-84 in Muenchen to the higher-ranked (#12) Bayern. The Regular Season already ended in the Euroleague. It's Strawberry's first season with the team. This year Strawberry's overall stats are: 8.6ppg, 1.8rpg and 1.9apg in 29 games. He is another player who holds two passports: Cameroonian and American. Strawberry is also Cameroonian national team player. #5. International forward Williams Narace (201-97, currently plays in France) led Sluc Nancy to a victory against the 11th-ranked Lille Metropole (10-15) 78-69 in the French ProB (second division) last Saturday. He recorded 12 points and grabbed 6 rebounds. Sluc Nancy Basket Pro (18-7) is placed second in the ProB. Narace's total stats this season are: 7.2ppg and 4.6rpg. He plays currently for the Cameroonian national team. #6. Guard Gedeon Pitard (188-89, currently plays in France) was not able to secure a victory for one of league's weakest teams Chalons-Reims (17-8) in their game against Monaco (14-7) in the French Jeep ELITE ProA. Pitard scored 9 points. But Chalons-Reims was defeated 93-86 at home by the higher-ranked Monaco (#3). They ended the series of five consecutive victories. Pitard's total stats this season are: 4.4ppg, 2.2rpg and 2.0apg. Despite he played previously for the French U18 national team, Pitard is also an international player who is currently on the senior Cameroonian National Team roster. #7. Former international center Junior MBida (206-90, currently plays in France) couldn't help Entente Orleans 45 (18-7) in their game against Denain Voltaire (8-17) in the French ProB (second division). He recorded 6 points, 6 rebounds and 3 assists in 24 minutes. Entente Orleans 45 lost 70-78 in Denain to the much lower-ranked (#15) Voltaire. This year MBida's total stats are: 7.0ppg, 5.4rpg and 1.2bpg in 25 games. He used to play for the Cameroonian national team four years ago. #8. Point guard Aldo Curti (180-87, currently plays in France) couldn't help Souffelweyersheim (9-2) in their game against STB Le Havre (12-9) in the French NM1 (third division). Curti recorded 5 points, 4 rebounds and 6 assists. The first-placed Souffelweyersheim (9-2) was defeated 75-63 in Le Havre by the lower-ranked STB Le Havre (#5) in the Places 1-10 group. Curti has averaged so far 9.9ppg, 3.1rpg, 5.1apg and 1.4spg. He used to play for the Cameroonian national team back in 2015. #9. Former international center Gaston Essengue (203-83, college: UNLV, currently plays in Argentina) helped CA Platense win their game against the sixth-ranked Ciclista (16-23) 72-54 in the Argentinian La Liga Argentina (second division) in Tuesday night's game. Essengue scored 10 points and grabbed 9 rebounds in 28 minutes. Club Atletico Platense Florida (28-10) is placed first in South - C.South group. His team will play only one more game in the Regular Season. And that game will be critical. Essengue has relatively good stats this year: 14.1ppg and 5.6rpg in nine games. He used to play for the Cameroonian national team four years ago. #10. Forward Benoit Mbala (203-95, currently plays in France) couldn't help Aix-Maurienne (8-17) in their last game on Friday. Despite Mbala's good performance Aix-Maurienne was edged 72-69 on the opponent's court by the much higher-ranked Poitiers (#9). He was the top scorer with 13 points. Mbala also added 8 rebounds. This season Mbala has very high stats. He averages: 15.2ppg, 7.0rpg and 1.2spg. Mbala is an international player who is currently on the senior Cameroonian National Team roster. #11. International forward Arnaud-William Adala Moto (198-93, agency: Duran International, college: Towson, currently plays in France) helped JA Vichy win their game against the 13th-ranked Paris 94-80 in the French ProB (second division) on Friday night. He recorded 7 points. Adala Moto has averaged so far 6.5ppg and 2.7rpg. He plays currently for the Cameroonian national team. #1. Joel Embiid (213-C-94, college: Kansas, currently plays in NBA) could not help the Philadelphia 76ers (50-30) in their last game. Despite his very good performance the Philadelphia 76ers (50-30) lost 122-128 on the road to the Milwaukee Bucks. Embiid had a triple-double by scoring 34 points, grabbing 13 rebounds and passing 13 assists in 37 minutes. It was 76ers' third consecutive loss in a row. There are only two games left until the end of the NBA Regular Season. So now every game will be critical. It's Embiid's fifth season with the team. He has individually a very good year with high stats. Embiid averages: 27.5ppg, 13.6rpg, 3.7apg and 1.9bpg in 64 games he played so far. #2. Pascal Siakam (206-F-94, college: N.Mexico St., currently plays in NBA) led Toronto Raptors to a victory over the Brooklyn Nets (41-40) 115-105 in the NBA last Wednesday. He was MVP of the game. Siakam recorded a double-double by scoring 28 points and getting 10 rebounds. He also added 5 assists; quite an impressive performance considering it's only Siakam's third season in pro basketball. The Toronto Raptors have a solid 57-24 record this season. His team will play only one more game in the NBA Regular Season. And now that game is very crucial. This season Siakam has very high stats. He averages: 17.0ppg, 6.9rpg and 3.1apg. #3. JP Tokoto (198-F-93, college: UNC, currently plays in Israel) was the major contributor in a Hapoel Eilat's victory against one of league's weakest teams Ironi Nahariya (6-18) crushing them 90-69 in the Israeli Winner League on Monday night. Tokoto had a double-double by scoring 15 points and getting the same number of rebounds. He also added 4 assists in 25 minutes. Hapoel Eilat (18-8) is placed fourth in the Winner League. It was his team's fourth consecutive victory in a row. Tokoto has relatively good stats this year: 14.2ppg, 7.6rpg, 3.4apg and 1.7spg in 26 games. He has a dual citizenship: Cameroonian and American. #4. Ralph Temgoua (194-G-87, college: St.Lawrence, currently plays in France) was not able to help SO Maritime Boulogne (3-9) in their last game. Despite Temgoua's good performance the ninth-placed SO Maritime Boulogne (3-9) lost 97-106 on the opponent's court to the higher-ranked (#7) Rueil in the Places 1-10 group. He recorded 10 points and added 4 passes in 30 minutes. This year Temgoua's total stats are: 9.1ppg, 2.8rpg and 2.3apg in 29 games. He is another player who holds two passports: Cameroonian and French. #5. Experienced Tcheussi Aristide Mouaha (190-G-0, agency: Two Points, currently plays in Italy) was not able to secure a victory for Roma S.Azzurra (15-12) in their last game. Despite his very good performance Roma S.Azzurra (#7) was crushed 80-56 on the opponent's court by the lower-ranked (#9) Scauri in the Group D. Mouaha had a double-double by scoring 26 points and getting 13 rebounds in 36 minutes. There are only two games left until the end of the Regular Season. So now every game will be important. Mouaha has very impressive stats this year: 17.5ppg, 5.3rpg, 2.6apg and 2.1spg in 27 games. #6. Nicolas Batum (203-SF-88, currently plays in NBA) managed to help Charlotte Hornets to win against the Toronto Raptors 113-111 in the NBA in Friday night's game. He scored only 3 points. This season Batum has relatively solid stats: 9.5ppg, 5.2rpg and 3.3apg. He has both French and Cameroonian nationalities. #7. Paul Herman Eboua (203-F/C-0, currently plays in Italy) contributed to an easy victory against the fourth-ranked Tezenis VER crushing them 106-85 in the Italian Serie A2 (second division) last Sunday. Eboua recorded 12 points, 7 rebounds and 2 blocks in 22 minutes. Eboua has averaged so far 6.0ppg and 3.4rpg in 28 games. #8. Philippe Bayehe (204-C/F-99, currently plays in Italy) is a teammate of previously mentioned Paul Herman Eboua and both played together in the last Italian Serie A2 game. Bayehe contributed to an easy victory against the fourth-ranked Tezenis VER crushing them 106-85. He recorded only 2 points in 14 minutes. Bayehe has averaged so far 1.5ppg and 1.1rpg in 26 games. #9. Cedric Keller (204-F/C-1, currently plays in Italy) is a teammate of previously mentioned Tcheussi Aristide Mouaha and both played together in the last Italian Serie B game. Keller couldn't help Roma S.Azzurra in their game against Scauri. He cannot count Sunday's game as one of the best ones. Keller recorded only 2 points. His team was crushed by 24 points 80-56. Keller has averaged so far 3.3ppg and 2.8rpg. #10. Jean-Dieudonniz Biog (205-C-95, currently plays in France) contributed to an ALS Basket's victory against the fourth-ranked Lourdes-Tarbes 83-78 in the French NM1 (third division) on Friday night. He recorded only one point and grabbed 5 rebounds in 18 minutes. Biog has averaged so far 5.4ppg and 4.0rpg in seven games. He also holds two passports: Cameroonian and French. Los Angeles Clippers (NBA) waived 32-year old Cameroonian swingman Luc Mbah a Moute (200-104kg-86, college: UCLA). In four NBA games he recorded 5.0ppg and 1.8rpg this season. The last season Mbah a Moute played at the Rockets where in 70 NBA games he averaged 6.9ppg, 3.0rpg and 1.1spg. Mbah a Moute helped them to win the Southwest Division title. In 2008 he was drafted by Milwaukee Bucks in second round (37th overall). Mbah a Moute attended Univ.of Calif.at Los Angeles and it is his eleventh (!!!) season in pro basketball. He also represented Cameroon at the Afrobasket Championships in Abidjan (Ivory Coast) six years ago. His stats at that event were 6 games: 11.5ppg, 5.7rpg, 2.0apg, 1.2spg, FGP: 50.0%, 3PT: 26.7%, FT: 67.6%. Mbah a Moute has spent his entire career in NBA playing for two other teams: Philadelphia 76ers and Minnesota Timberwolves.